Hive electronic identity is the familiar microchip, also used on dogs. Its size is really small, with a length of 2 cm and about a needle’s thickness. We drill a tiny hole open, using a thin drill, and we place the glass vial containing the chip inside the hole. After we’ve filled the hole with putty and painted the hive, nobody but us knows where the identity is: at the lid, the main body or the bottom. We can even place the chips on a hive panel. In the event of a theft, the thief will cover the fire seal with putty, painting the hive over and fire sealing it with its own number. Now there is no telling sign of the genuine hive owner apart from the microchip. With an Electronic Reading Device we scan the hives and distinguish the chip number, provided of course that a chip is present. 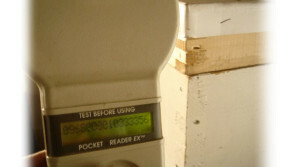 There is also a stronger electronic reading device that can read the microchip serial number even from a 15 meter distance. This means that during an inspection, from an apicultural association or some other institution, it won’t be necessary for the inspector to go too close to the hives. Furthermore, in the event of an inspection on loaded vehicles, hives hidden behind the external ones can be easily checked without unloading any of them; this way the task of the inspection is made much easier, facilitating greatly the arrest of the thieves on the act. All this provided that the hives’ owner has placed a microchip on them (or at least on some of them). The microchip does not emit any radiation. It only mirrors the radiation that receives from the scanner. It doesn’t disturb the bees at all. It doesn’t contain any kind of battery. After its installation, we never have to deal with it again – except from the unfortunate case that we will need to prove ownership of a particular hive. The glass vial containing the microchip is really inexpensive.